A classic Midwood bungalow perfectly located just minutes from shopping and dining in Plaza Midwood, Noda and Uptown! 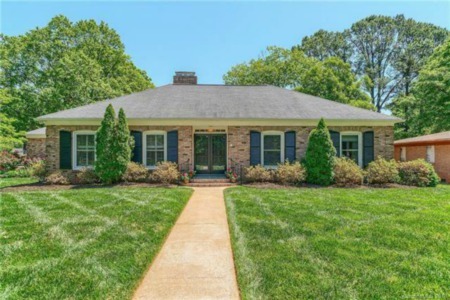 This charming three bed two bath home features hardwood floors throughout as well as granite in the kitchen and master bath. The kitchen also offers plenty of counter space and stainless steel appliances. The large master bedroom with en suite boasts a jetted soaking tub, double sinks and a large closet. Outdoor living is a breeze here and you can easily enjoy a quick walk to Midwood Park or entertain in the large, private and fenced backyard. Lot size is nearly .25 acres! This is a true Plaza Midwood gem with charm, location and convenience waiting for you to call it home. SchoolsClick map icons below to view information for schools near 1500 Brook Rd Charlotte, NC 28205. Home for sale at 1500 Brook Rd Charlotte, NC 28205. Description: The home at 1500 Brook Rd Charlotte, NC 28205 with the MLS Number 3469849 is currently listed at $359,000 and has been on the Charlotte market for 81 days. You are viewing the MLS property details of the home for sale at 1500 Brook Rd Charlotte, NC 28205, which is located in the Midwood subdivision, includes 3 bedrooms and 2 bathrooms, and has approximately 1076 sq.ft. of living area.